There is a guide available from the internet that gives you information on how to buy and import cars from Japan. There are guides for importing from Japan to Australia, Japan to the UK , Japan to Canada, and Japan to the US. They say"
guide that will get you importing cars from Japan all by yourself.Why import a car rather then buy cars locally? The choice of cars is much much larger! - You can buy your car from private sellers in japan, from car auctions, from car yards and many other places such as Yahoo Auctions Japan. Save a ton of money by importing your next car from Japan - If you were to buy your Japanese car locally you would pay much more then importing it yourself. Buy and sell for profit - Making money on Japanese import cars is easy. Buy cars for cheap in Japan, import them and sell them for a profit in your country! It is easy to make huge profits if you import the car yourself. I personally made over $120,000 last year by doing exactly this. Let me show you how to do it! I have written 4 separate guides so you can import cars and sell them for massive profits. Learn how to import a car from Japan to USA, Canada, Australia and the UK. All 4 guides will help you successfully import a car from Japan to your country. Whether you want to import a quality Japanese performance vehicle like a Skyline or Supra, or a family car like a Delta wagon, my guide will show you how. You will find out exactly how to import any car from Japan to your country for as cheap as possible. Each of my guides have their own countries customs and registration requirements, so you can be sure to import cars with no worries at all.
" I haven't read these guides yet, but I would be interested to see what they say about importing cars to the US. Obviously the US is a little harder than other places to import a car to. 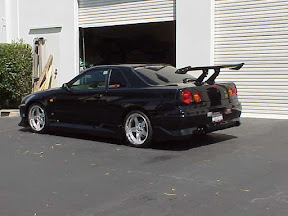 how hard is it to import a R34 to the USA??? LOL Reads like midnight cable house flipping adds.